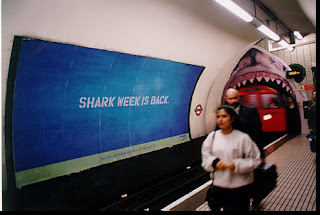 To promote 'Shark Week' in the UK, the Discovery Channel ran some innovative underground advertising. A poster facing the platform announced that 'Shark Week is Back', whilst the tunnel was turned into a Sharks mouth! Clever and impactful.